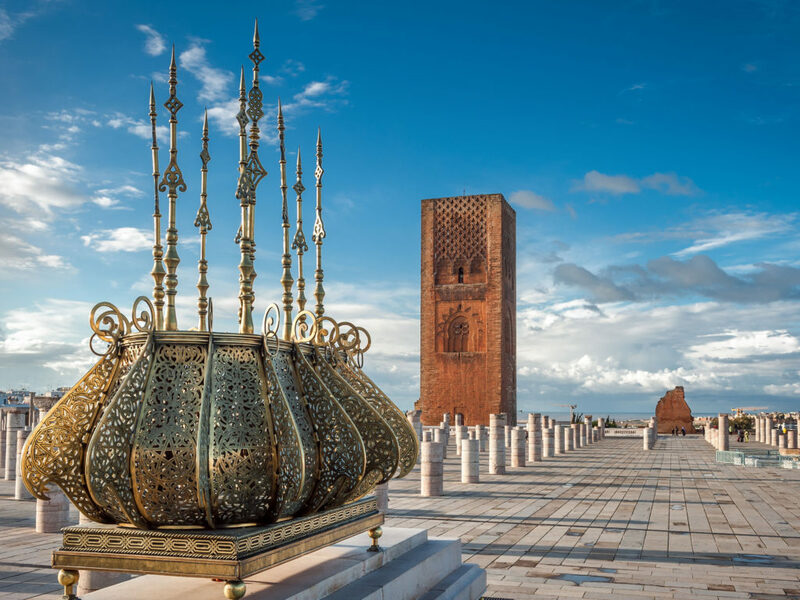 On arrival to the airport and after completing Immigration and custom formalities you will be met and transferred directly to your Hotel, afternoon, you will be drive to the truly magnificent Hassan II Mosque the second largest mosque in the Islamic world after the Masjid al- Haram in Mecca. 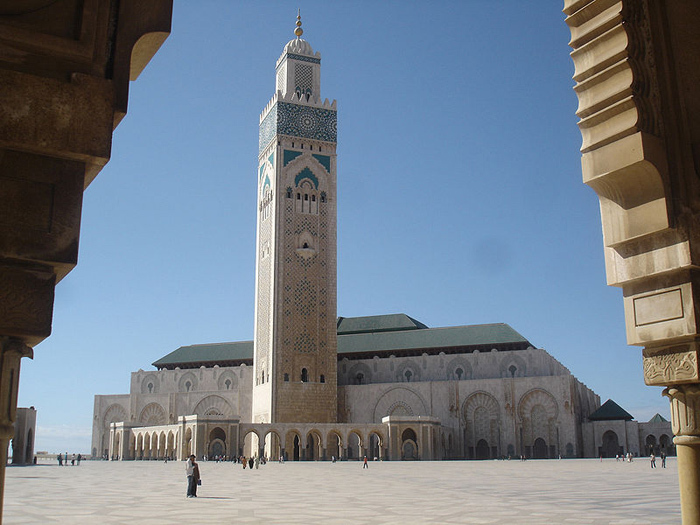 This architectural masterpiece, a symbol of an Islam open to the world, took 7 years to complete using 50 million man-hours and inaugurated on the 30th August, 1993 was built partially on the waters of the Atlantic Ocean, on the farthest western point of the Maghreb. Conceived by the French architect Michel Pinseau (1924-1999) The Mosque employed 3,300 craftsmen from all over Morocco; has 53,000 m² of carved cedar wood; 67,000 m² of plasterwork and some 10,000 m² of sculpted ornamentation and writings; it contains on the ground floor an oblong Prayer Hall of perfect symmetry measuring 200 x 100m. Supported by seventy-eight pillars where granite, marble and onyx mix their respective reflections, this vast room supports a retractable roof covered with emerald green tiles – the symbolic colour of Islam, representing Mother – to welcome to prayer 25,000 believers inside and 80,000 on the adjoining esplanade. Embedded in the axis of the southern facade, a 210 metre-high minaret, boasts a laser beam of 30km reach pointing towards Mecca. This magnificent Mosque also encompasses a Medersa (School of Koranic learning), a Library, a National Museum and immense lecture halls, all beautifully decorated by artisans from all over Morocco: frescoes and zelliges in traditional geometrical motives, painted and sculptured woods, stuccos of intricate designs, arabesques in decorative drawings and writings in brilliant colour inaugurated in 1992 and a masterpiece of Moroccan architectural design and craftsmanship. 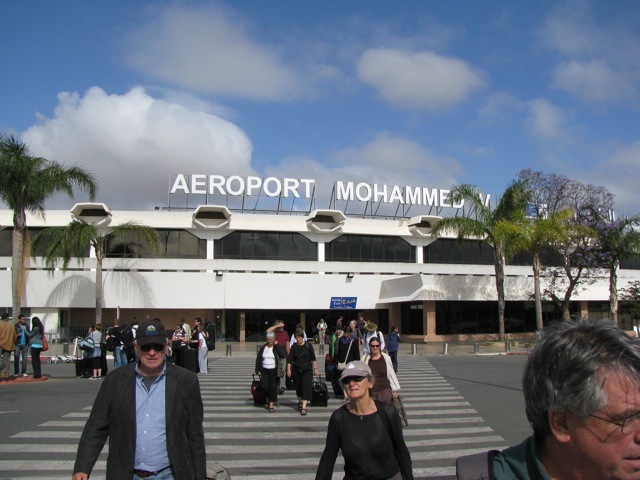 Breakfast, then departure to Rabat, The political capital of Morocco (in Arabic Ribat) was founded in the 10th century near the ruins of the Phoenician a later Roman port of Sala Colonia at the mouth of Bou-Regreg River. 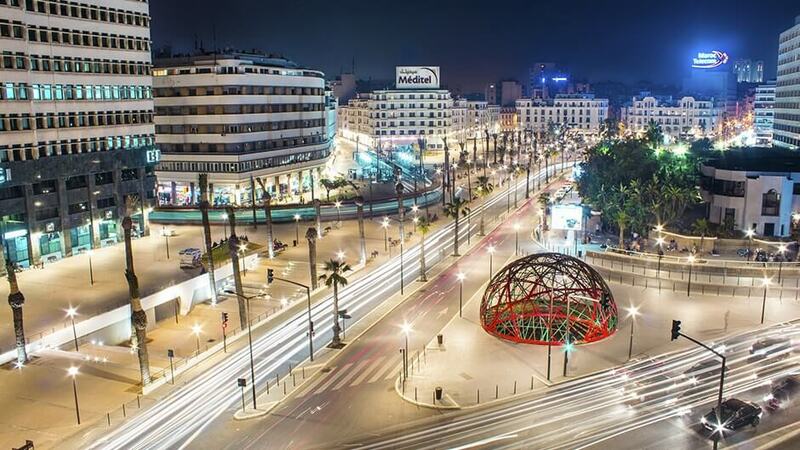 It became the capital of the great 12th-century Almohades conqueror Yacoub El Mansour, who ruled an area that extended from Tunisia to northern Spain. 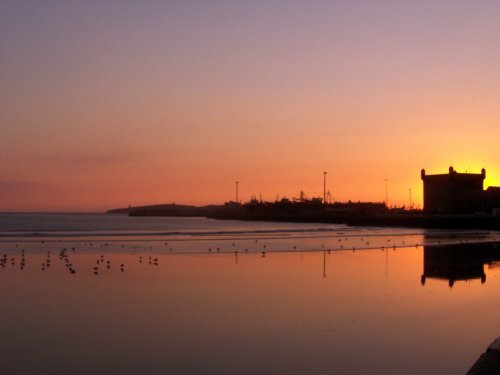 After the death of Yacoub el Mansour, Rabat lost much of its importance and was not to recover its status as capital until the French occupation in 1912. Visit by the Mechouar (Royal Palace precinct) of the Palais Royal, built in 1864 on the ruins of a late 18C property. The inside is not open for public; it contains the Royal Cabinet, Ministry of the Royal Household and the prime minister’s offices. Drive through the ramparts for a photo stop at Chellah Necropolis gateway (old sala colonia which was for 15 centuries the site of –Phoenician, Roman, Berber and Arab- of Sala). Continue to The Hassan tower; is unfinished minaret of Hassan Mosque, constructed by Yacoub el Mansour in the last five years of his reign after his victory over the king of Castle and Leon at Alarcos. 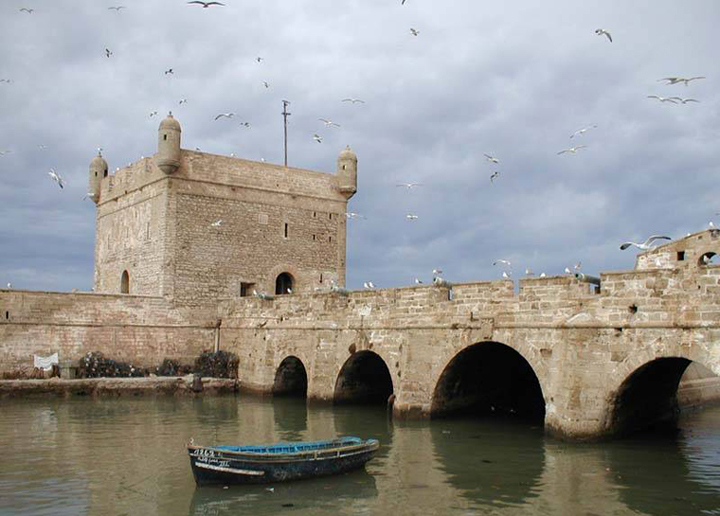 Bab Mansour (The Victorious gateway): This monumental gateway separates the central square of the Medina, Place el Hedim, from Moulay Ismail’s vast enclosed imperial city. It has come to symbolize Meknes: It is reproduced in countless books, articles, postcards and posters. Continue you pleasant drive to Holy city of Mulay Idriss, home to the sanctuary of its namesake; Moulay Idriss is Morocco’s patron saint. The picturesque little town is a national pilgrimage site as it holds the Tomb of the holy saint Moulay Idriss. On to Volubilis or “Oualilli” as it is known by the Berber, easily ranks among the best preserved Roman towns in North Africa. 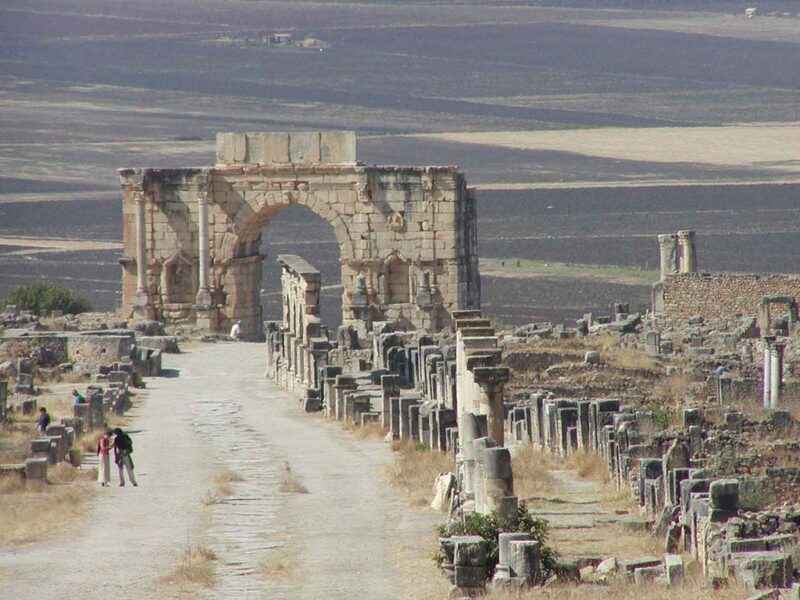 Volubilis was once the home of Cleopatra’s daughter who eventually married the Berber King Juba II. 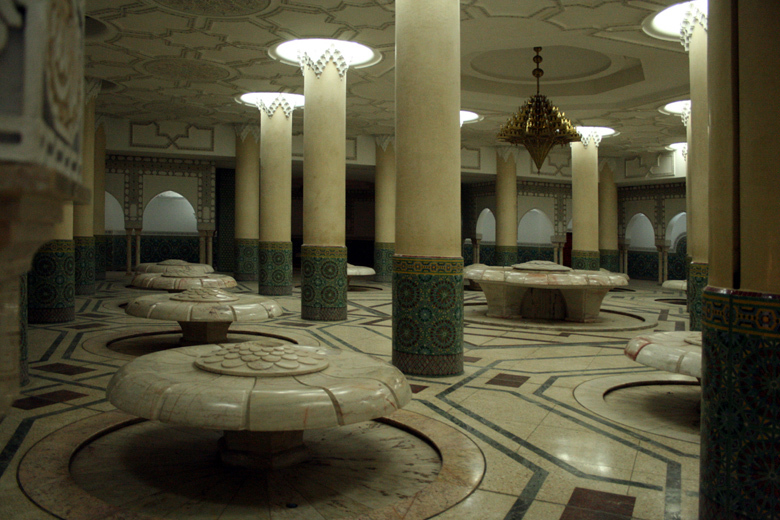 Late afternoon, arrive to Fez, Check in at your hotel for Overnight at the Riad la Perle de la Medina. 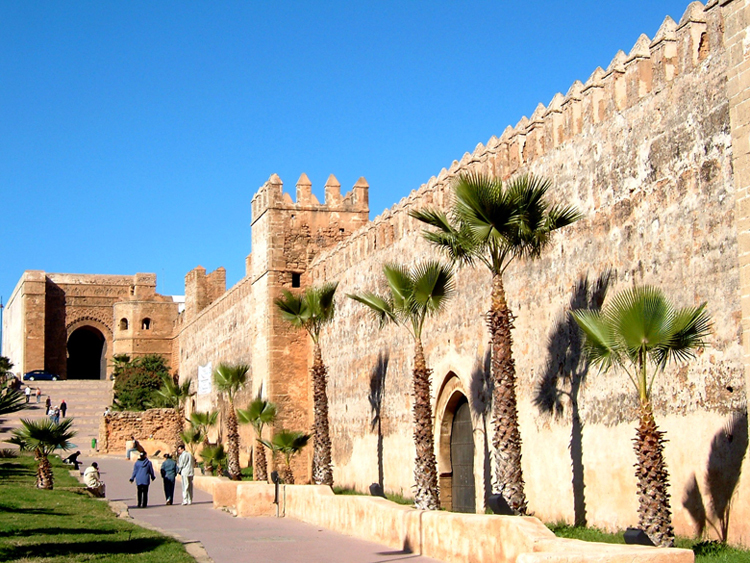 Depart for full day sightseeing of Fez. The oldest of the imperial cities, FEZ is arguably the symbolic heart of Morocco. 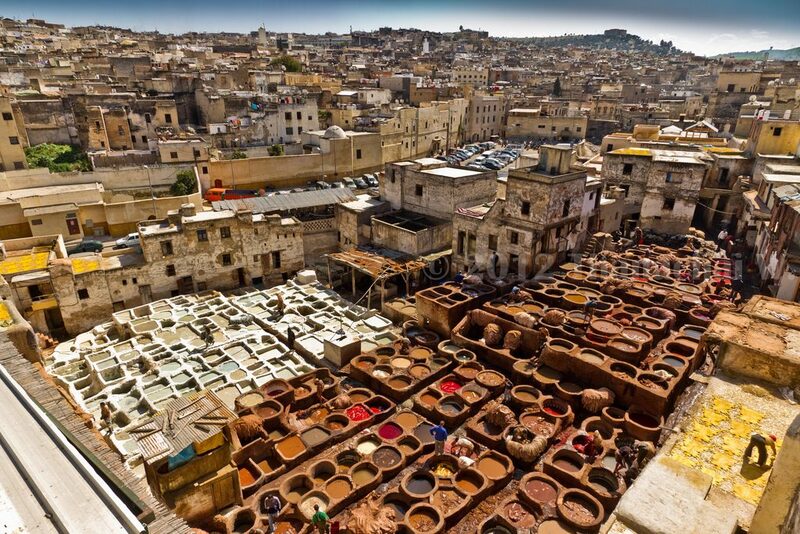 After Today you will explore this exciting, fascinating, two-thousand year old Imperial City of Fes. 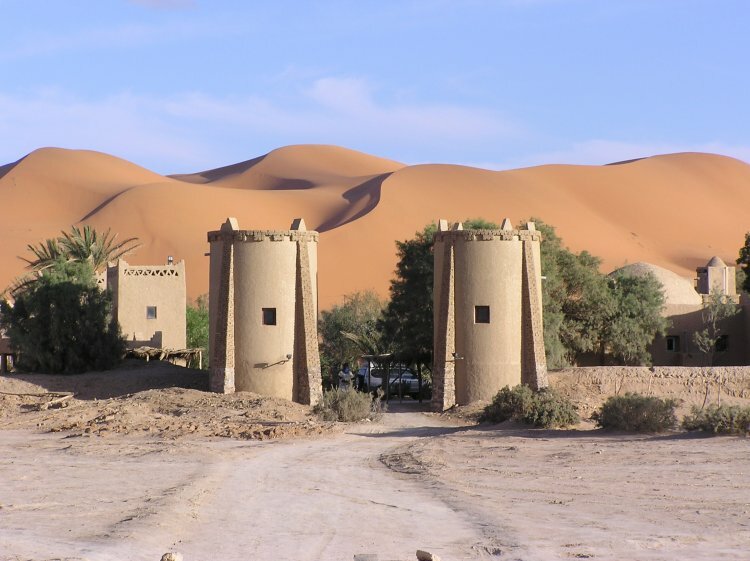 Surrounded by 9 miles of ramparts in a narrow valley, it is strategically positioned on the old caravan crossroads which once connected the Saharan empires with the Atlantic and Mediterranean trading routes to Europe. 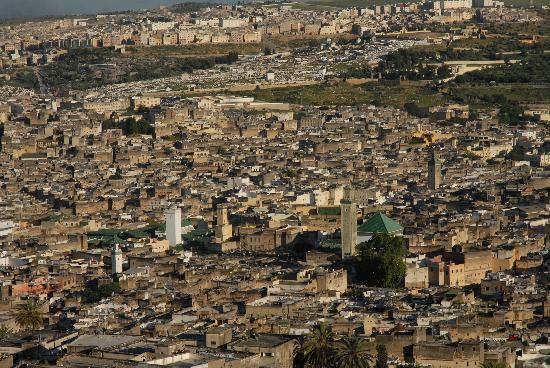 Fes was known as one of the holiest cities in the Islamic world besides Mecca and Medina. 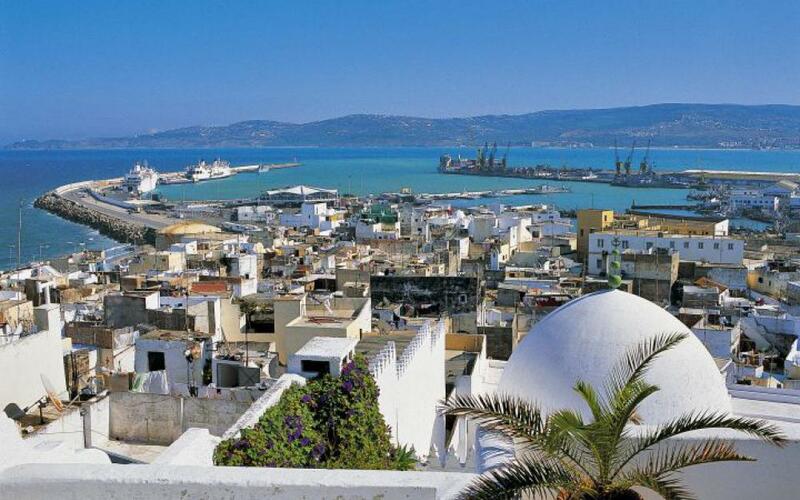 Moroccans say that Marrakech, Rabat and Casablanca live in the present, but that Fes certainly lives in the past. European chroniclers of the middle Ages wrote that for several centuries Fes was the most civilized Western outpost of the Semitic world. Its scholars introduced astronomy and medicine to the West via Spain. Historians of the time said that the writings of both Plato and Aristotle first reached Western Europe in Arabic translations – again from Fes. 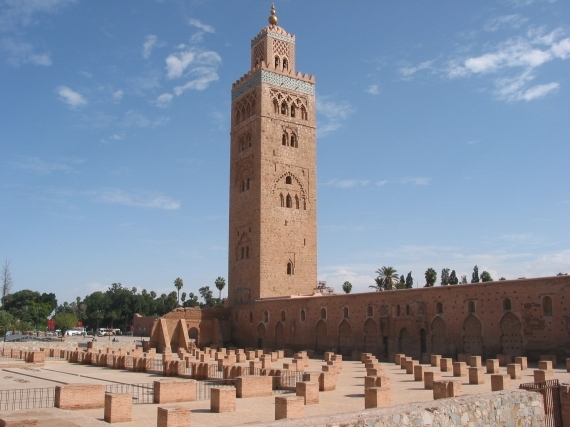 Today you will see the The Kairaouine Mosque (Djemaa el Kairaouine the second-largest mosque in Morocco (outside as non-Muslims are not permitted to enter the mosque). Admire the ancient gate of Bab Boujeloud. See the impressive Dar el Makhzen we drive to the Borj Sud to take in the panoramic view of the Medina. Then a Walking Tour of the labyrinth of the ancient and amazing Fes Medina and Mellah (a UNESCO World Heritage Site). See the Bou Inania Mosque, the colorful es Sabbaghine with its Street of the Dyers; the impressive al Quarawiyyin Mosque and University (exterior only) and the el Atterine Medersa (exterior only). Your guide will take you through the bustling maze of alleyways of the fascinating medina and souks. Offered here is every possible combination of beautiful pottery, Berber carpets, Fassi brassware, Jewish silverware, traditional and modern jewelry, and beautiful leather goods. Amidst all this you will find the pungent aromas of spices, herbs and oils. 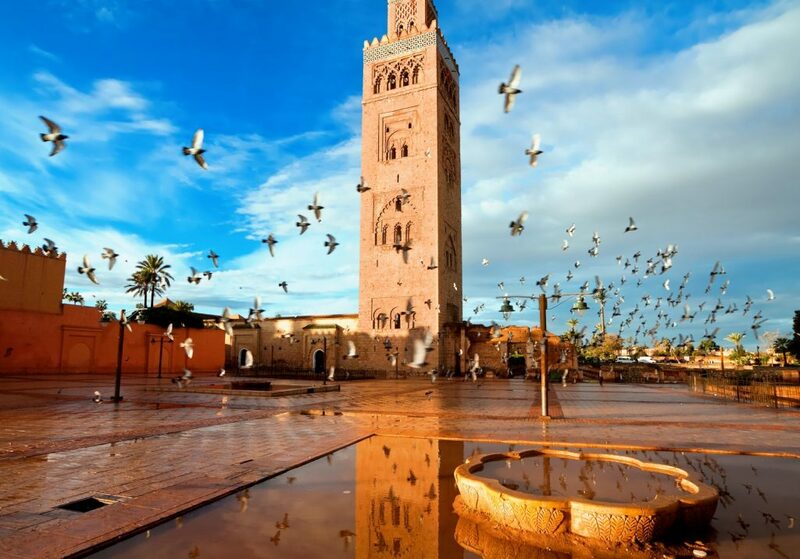 Next pass the delightful el Nejjarine Square and fountain, then on to the renowned Tanneries of Chouara on the bank of the Oued Fes. Leaving the Medina we make our way to the 16th century Saâdien watchtower at the North Borj. Overnight at the Riad El Amine. 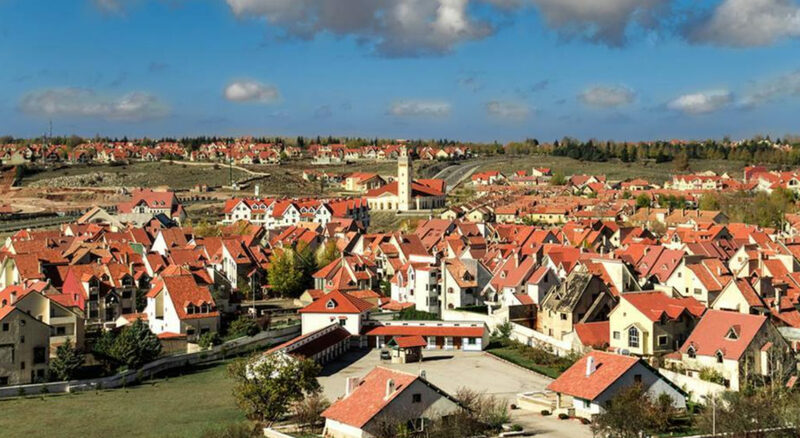 Ifrane: was created in 1929 as a self-conscious “poche de France”. 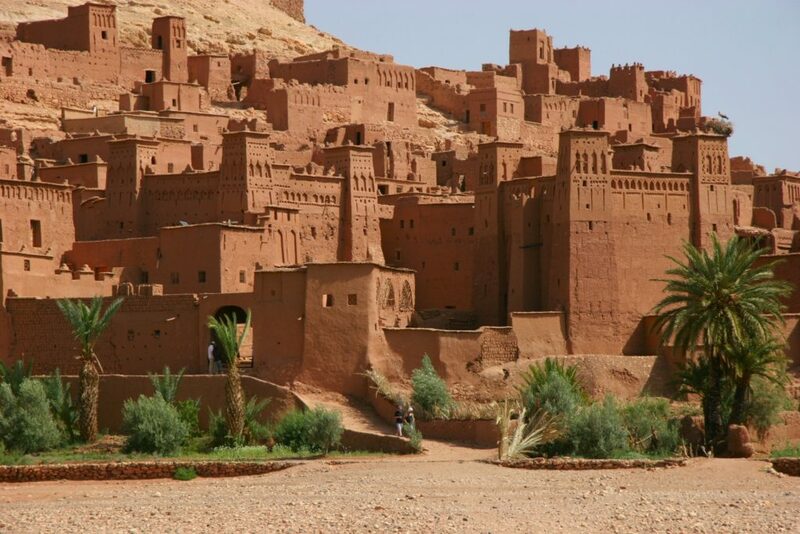 It is so a small city different in relation to the rest of Morocco that one would believe itself in a Swiss village. It is indeed a well-known skiing station, with its chalets, its pull-buttocks and other ski lifts, its well-off and clean streets, its odour of forest and its freshness of altitude. While walking in the streets of Ifrane, one forgets the city herself doesn’t offer a lot of interest of the point of historic view it is a European creation of the years 1930. But it is a pleasant and cool stage, and its vicinity is very interesting. Ifrane is the Moroccan estivage center the more frequented. The province of Ifrane is at the heart of the Middle Atlas with a surface of 3573 km2. It is lived by two big Tribes Sanhajas and Beni Mguil. This city became a high place of the winter sports. With its chalets to the roofs covered with red tiles, it is situated to 1650 m of altitude. Its natural wealth’s brought the persons responsible of the region to create a national park of 53000 ha. In its region you can find the biggest forest of Cedar in the country. The first traces of the human installation in the region go back up to the Neolithic. Of the underground cave as those of Tizguite as well as the archaeological vestiges going back to the prehistory in Zerouka, Ghabt, Al Bahr and Ittos. On January 16, 1995 King Hassan II inaugurated the higher education institute “Al-Akhawayn”University.Al-Akhawayn means the two Brother (in Arabic), registers it as being the brainchild and beneficiary of the Moroccan King and his brother the king of Saudi Arabia “Fahd”; it has also been Funded by the United States. The undergraduate and graduate curricula are modeled on the American system of higher education and the language of instruction is English. Azrou: is a Berber town of 45,000 inhabitants, caught between steep wooded hills and facing a distinctive puckered volcanic outcrop. From this the town gets its name. The word AZROU means the “ROCK” in the Berber dialect. 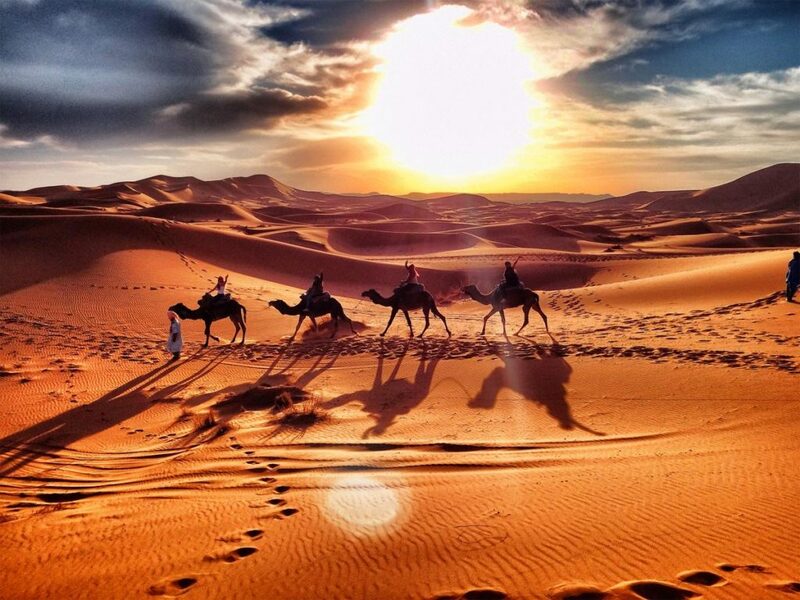 Arrival to Merzouga, Check in at your hotel Tombouctou, Camel ride to watch the sunset, dinner and overnight.